"All you've ever done is leave. Everybody loves somebody eventually…" Aw, charming and true. Pantelion Films has debuted the trailer for an indie romantic comedy titled Everybody Loves Somebody, from Mexican filmmaker Catalina Aguilar Mastretta, about a big wedding in Mexico. Mexican actress Karla Souza (seen on "How to Get Away with Murder") stars as Clara Barron, a woman who has trouble figuring out her love life. During her trip home for a wedding, her "crazy" family provides her with some guidance for her life. The full cast includes José María Yazpik, Ben O'Toole, K.C. Clyde, Tiaré Scanda, Patricia Bernal, and Alejandro Camacho. This probably won't appeal to everyone, but it does have some charm. On the surface, the young and beautiful Clara Barron (Karla Souza) seems to have everything - a great job as an OB-GYN; a great house in LA; and a big fun-loving Mexican family. But, the one thing Clara doesn't have figured out is her love life. Pressured by a family wedding in Mexico, Clara asks a co-worker to pose as her boyfriend for the weekend festivities - only to be caught by surprise when her ex- boyfriend (and family favorite) suddenly shows up after disappearing from her life completely. Torn, Clara must decide between going back to the past or open her heart to new and unexpected possibilities. 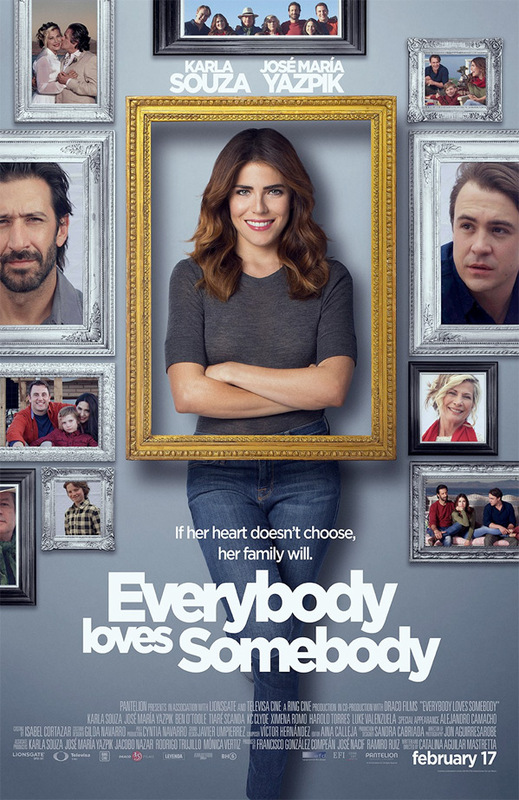 Everybody Loves Somebody is both written and directed by Mexican filmmaker Catalina Aguilar Mastretta, of the film The Hours with You previously. Pantelion Films will release Everybody Loves Somebody in select US theaters starting February 17th, 2017 coming in the next few months. Anyone interested in seeing this? Plot torn straight out of a CW series.